The Emularity « Adafruit Industries – Makers, hackers, artists, designers and engineers! Jason Scott has a great blog post about progress being made at the Internet Archive on archiving old DOS and Windows programs. Through the hard work of JSMESS developers they now have Windows 3.1 working in an emulated DOS environment on a webpage. 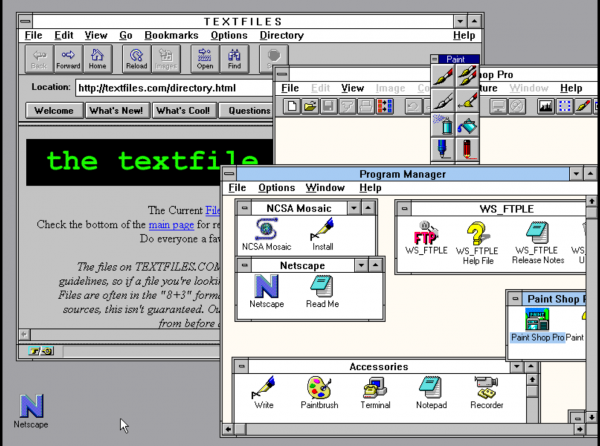 Not content with just running Windows, they even sorted out how to get the ancient operating system online and browsing the web with Netscape 1.0n! Jason feels we’ve reached the ‘Emularity’ (a riff on the singularity), where progress in emulating old computers in a web browser has reached a point where new systems can quickly be emulated. Nice work to all involved with the project!